The Cooper Emergency Power Control (CEPC) for Greengate and iLumin Lighting Control Systems supports switching along with two-, three-, and four-wire dimming. Under normal power conditions, it switches and dims emergency fixtures in tandem with the non-emergency fixtures. 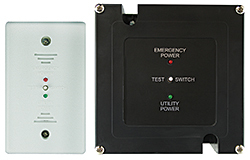 When normal power is lost, the CEPC detects the loss and forces the connected emergency fixtures to full on. How Can CCTV Surveillance Systems Improve Security?